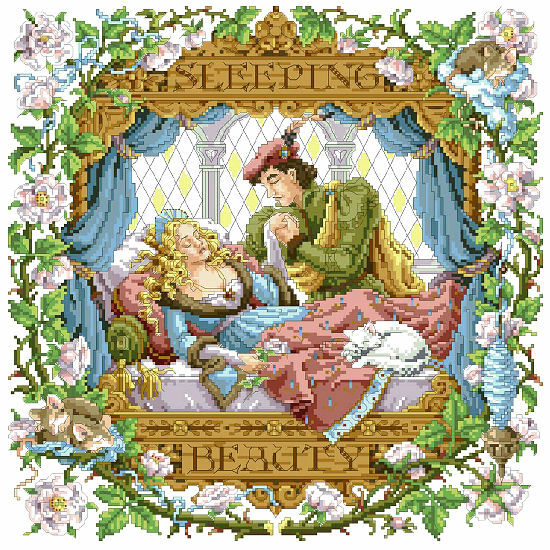 Sleeping Beauty pricked her finger on the spinning wheel and had no idea that she would have to wait until her handsome prince came to wake her. She’s surrounded by vines of fragrant flowers and little animal friends as she sleeps. This is one of three of Sandy Orton’s adaptations of the popular princess fairy tales. Contents: Stitch Count 182w X 182h, Finished Size on 14ct: 13" x 13"